The birds have been actively engaging in constructive conversation and dialogue in my studio this fall. Come for a sneak preview of this new body of work and visit some of your old favorites. Monoprints, Limited Edition Prints, Cards and Sketchbooks will be for sale. 10% of sales will benefit Frog Hollow. Join me for this fun event! See my printmaking studio and some of the new work that I am working on. A gorgeous view of the Winooski River and the Intervale. From Burlington: Rt 127N (Northern Connector), at the 2nd light go right onto Macrae Rd. 1/2 mile on right. From Exit 16: North on Rt 7; left on Blakely Rd, Left on Lakeshore Dr; Left on Prim Rd; Left on Macrae Rd; 1/2 mile on right. Artists are often identified by the subject matter they work with. In this exhibition I am interested in creating a conversation between Knitting and Crows, two bodies of work I have been engaged and identified with over the past ten years. In this series of hand pulled monoprints, issues of community, life, transition, process and communication are explored. For many years, crows and birds brought threads to a communal nest and held the thread of conversation between themselves. 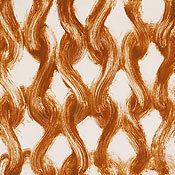 Over the years the threads have become yarn, knitted and tangled, unraveled and reconstructed. Patterns and process are explored and enlarged as it relates to the rhythms and transitions of our daily lives. The birds continue to fly in and out bringing their voices to the conversation. Carol E.S. 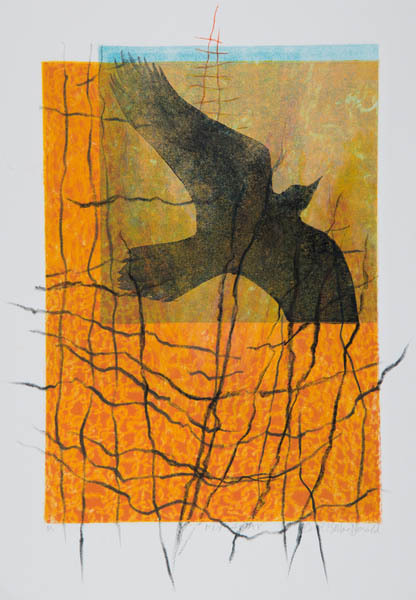 MacDonald is an artist, and master printmaker living and working in Vermont. She attended the Maryland Institute College of Art and the Lake Placid School of Art. Recent solo exhibitions include: Line / Structure / Pattern, Washington Printmakers Gallery, Silver Springs, MD; The Thread: A 40 Year Retrospective, VCAM/RETN Art Space, Burlington, VT; Knit Monoprints, Galerie Maison Kasini, Montreal, Quebec; Cast On – Bind Off, Firehouse Gallery, Burlington, VT. She was a featured artist at Vogue Knitting: LIVE in New York City and Chicago. Her work was shown in Foot Print International at the Center for Contemporary Printmaking in Norwalk, CT, Papier 12, Contemporary Art Fair in Montreal, Quebec and Parallax Art Fair in New York City and Miami. 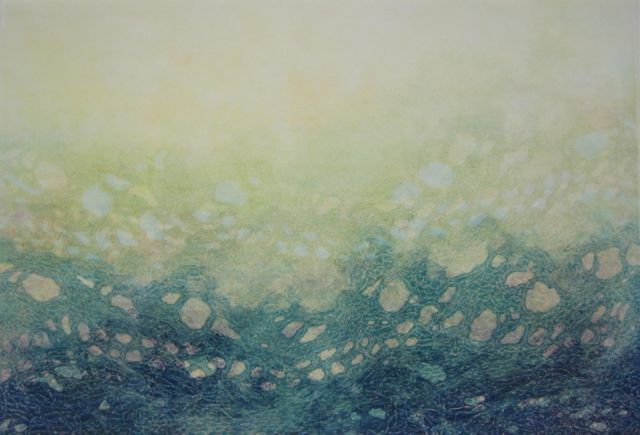 MacDonald has been an artist fellow at the Virginia Center for Creative Arts, and the Vermont Studio Center. She received the 2008 Barbara Smail Award from Burlington City Arts, an Artist Opportunity Grant from the Vermont Arts Council in 2007 and the Susan B. Anthony Award in 1999 from the YWCA for Leadership in the Arts. Her work is in many private and corporate collections. Including: Robert Hull Fleming Museum, Burlington, VT; Johnson & Johnson Corp, NJ; Champion Paper International, Stamford, CT; San Francisco Public Library, San Francisco, CA; Gelman Library, George Washington University, Washington DC; Shearson Lehman, American Express, NY, NY.